Readers of my Malcolm & Suzanne Rannoch books know that part of Suzanne’s backstory is that in 1811 she accompanied Hortense Bonaparte, the Empress Josephine’s daughter and Napoleon’s stepdaughter, on a secret journey into Switzerland. The reason for the journey was so that Hortense could give birth in secret to her child by her lover, the Comte de Flahaut (who appears in my most recent book London Gambit). Suzanne’s involvement in this interlude is of course fictional, but Hortense Bonaparte did indeed go secretly into Switzerland in 1811 to give birth to her child by Flahaut (who joined her for the birth). 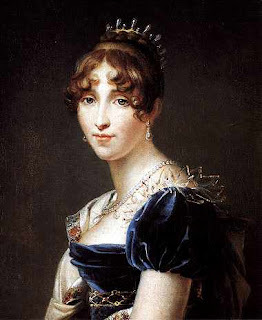 Hortense was born Hortense de Beauharnais on 10 April 17883, the daughter of Josephine and her first husband, Alexandre de Beauharnais. Her parents separated when she was very young, and she lived with Josephine. Her father was guillotined in 1794 and her mother was imprisoned in Les Carmes and nearly went to the guillotine as well. After the Terror, Josephine reigned over Directoire society as the mistress of Paul Barras, and later, in 1796, married Napoleon Bonaparte. Napoleon was fond of Hortense and her brother Eugene and treated them as his children. But as he became more and more of a monarch, he became more and more concerned with having an heir, and he and Josephine had no biological children of their own. In 1802, Napoleon and Josephine pushed Hortense into a marriage with Napoleon’s younger brother Louis with the idea that one of their children could be Napoleon’s heir. Unfortunately, the cheerful, artistic Hortense and serious, intellectual Louis were not temperamentally suited and the marriage was strained from the start. But within a year of their marriage they had a son, Napoleon Louis Charles, who became Napoleon’s heir presumptive. (My fellow Hoyden Lauren beautifully captures Hortense as the mother of a toddler, organizing theatricals at her mother’s chateau at Malmaison, in her wonderful The Garden Intrigue). In 1804, Hortense and Louis had a second son, Napoleon Louis. In 1806, Napoleon made Louis King of Holland, and Hortense reluctantly left Paris for the Hague. She came to appreciate her life and role there, but her marriage to Louis continued to deteriorate. In May 1807, tragedy struck. Hortense and Louis’s eldest son died of croup before his fifth birthday. The loss of their child seems to have exacerbated the strains in an already strained marriage, though they did have a third son, Charles Louis Napoleon (who later became Emperor of France as Napoleon III) in 1808. Hortense began to spend much of her time in France, theoretically for her own health and that of the children. Effectively separated from Louis, she began a love affair with Auguste-Charles-Joseph, Comte de Flahaut, a handsome and charismatic army officer, who already had a string of well-known love affairs in his past. He was officially the son of his mother’s husband, the late Comte de Flahaut, but it was widely acknowledged that his real father was almost certainly his mother’s lover Prince Talleyrand, Napoleon’s longtime foreign minister (and another important ongoing character in the Malcolm & Suzanne series). In 1811, Hortense found herself pregnant, and there was no way her husband could be the father. She managed to conceal her pregnancy through the celebrations around the baptism of Napoleon's son with his second wife, Marie Louise. Hortense was one of the godmothers and by then was five months pregnant (thinking back to my own pregnancy, I can only imagine Hortense must have been very thankful for the high-waisted gowns that were in vogue). Shortly after the baptism, Hortense traveled secretly into Switzerland. On 21 October she gave birth to a son at an unnamed inn. Flahaut joined her for the birth. His mother, Adelaide de Souza, took the baby back to France with her and raised him (a deceptive birth certificate gave him the title of the Comte de Morny). He became an army officer and statesman and also wrote plays under a pseudonym. Many years later, his half-brother, then Napoleon III, made him Duc de Morny. Going to be quiet this week as I'm in San Diego enjoying the annual romance writers conference. I'll report in next week. So far it's lovely. 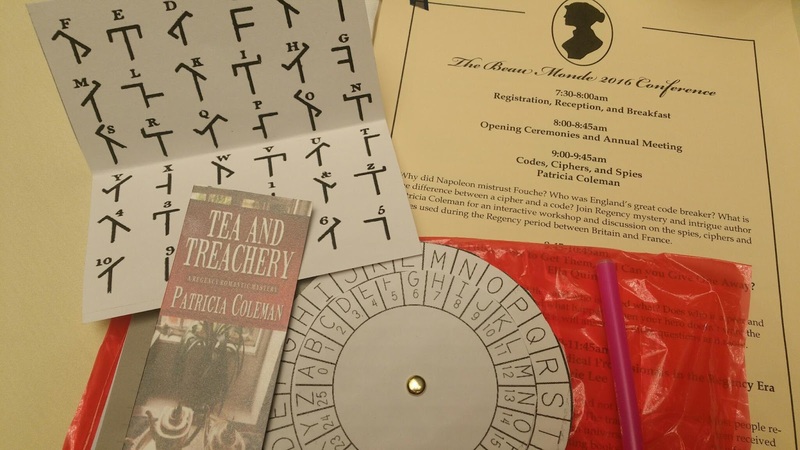 Just enjoyed a wonderful workshop on codes, spies, & cipers.